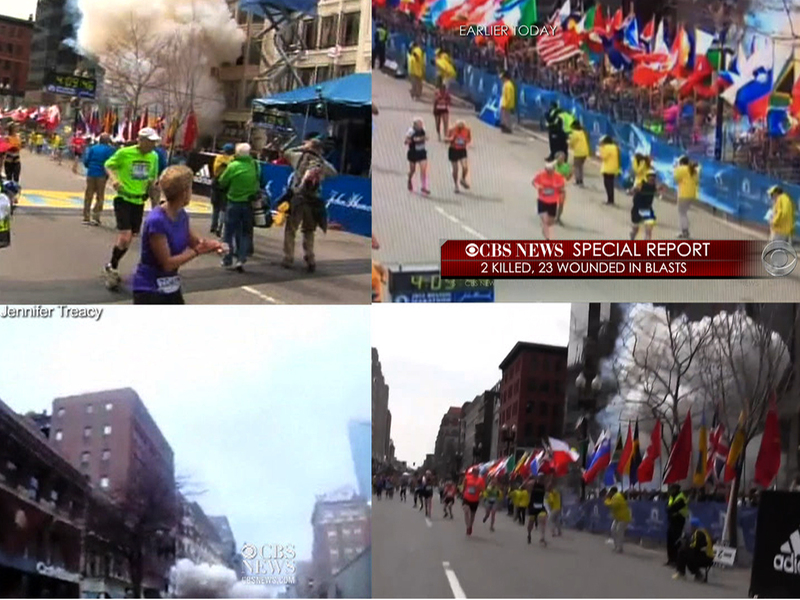 (CBS News) -- As law enforcement agencies investigate Monday's bombings at the Boston Marathon -- and ask the public for photos, videos and information that might help find the perpetrators -- some corners of the Internet have launched their own "investigations." For years crime tip lines and even television shows have utilized the help of large groups of people, a technique known these days as "crowdsourcing," to aid in police investigations. Shortly after the first episode of "America's Most Wanted" aired in 1988, tips poured in about convicted killer David James Roberts, an FBI Ten Most Wanted fugitive, leading to his capture after 20 years on the run. But crowdsourcing in the Internet age has taken the public's involvement in solving crimes to a new level. In April of 2012, police in Waynesboro, Va., were investigating a fatal hit-and-run when the investigation ran out of steam. "We were at a road block," Capt. Kelly Walker told Crimesider. "There wasn't any way to move forward until we identified the car." Looking for help from the public, the department issued a press release with a photograph and description of a piece of metal left at the scene of the crime. Soon, the popular automotive blog Jalopnik picked up the story, and commenters were able to identify the evidence as part of an early 2000s Ford F-150 pick-up. Walker says the site contacted the department and the identification helped lead to suspects who were later convicted. "It was really a big help," says Walker. So big, that last December, the department presented the site with a community service award. Successes like this have led more and more law enforcement agencies to use social media as an investigation tool. An annual survey conducted by the International Association of Chiefs of Police found that in 2011, 40 percent of agencies were using social media to solicit tips from the public. Just one year later, that percentage jumped to 56.8 percent. "Response is quicker; and the scope is much larger - than the traditional tip line," says Nancy Kolb, a Senior Program Manager who works with the organization's center for social media. Kolb and the center work with law enforcement to enhance their capacity to use social media to prevent and solve crimes. Kolb says the most common examples of law enforcement reaching out involve posting photos or videos asking for the public's assistance in identifying a suspect or a witness who may be able to provide more information. "It's about reaching the right audience, getting the right people," says social media expert Kenneth Wisnefski, founder and CEO of the Internet marketing website "WebiMax." Wisnefski says people appear to respond well to requests for specific information, and the Internet's ubiquity factors into the public embracing it as a tool for reporting crime. "Social media is at the forefront of events," Wisnefski says, noting how much information regarding the recent bombings was picked up and communicated first through sites like Twitter and Facebook. "We haven't really had opportunity like this before for crowdsourcing on this scale." Forensic video analyst Grant Fredericks says that when investigators sought information about rioters in Vancouver in 2011, they received 5,000 hours of video from the public, which helped them find suspects. "We're in an electronic age, a surveillance society," says Fredericks, who teaches video analysis at the University of Indianapolis and the FBI National Academy in Quantico, Va. "Everyone walking around with a cell phone has an opportunity to collect evidence." Fredericks says the amount of video evidence available to law enforcement through crowdsourcing is an incredibly valuable tool, but that investigators often run into trouble because they've "asked the public to decide what's relevant." He also warned, "We don't want vigilantes deciding who's guilty or not." The danger of this point was illustrated this week as users on the social news website Reddit created forums dedicated to combing through pictures of the crowds near the marathon's finish line and discussing evidence in search of answers. On the forum thread "findbostonbombers," users speculate about various theories and "suspects." "Green Hat Man in center of photo. He's wearing what seems to be a heavily-stuffed backpack. Anyone spot him in any other photos?" asked one Reddit user. "That guy is walking away from the location of both bombs, they're down the street behind him, about 11 mins before the explosions." Another commenter responds. "So that would mean the backpack he's carrying is highly unlikely to be that in which either of the bombs was secreted." Much of the theorizing was accompanied by images altered or written on, pointing out "suspicious" details or possible suspects. "It brings a lot of benefits, but also a lot of challenges." Kolb says about the influx of information online. "Rumors spread quickly, and inaccurate information." Kolb says there have been situations where people are wrongly identified by the public and subjected to scrutiny and harassment despite never having been considered suspects by law enforcement. One name that has come up frequently in the past few days is that of Richard Jewell, a security guard accused in the bombing at the Atlanta Summer Olympic Games in 1996. Jewell was eventually cleared of wrongdoing, but not before suffering years of being hounded in the court of public opinion despite never having been charged in the attack. "Law enforcement officials are trained investigators" Kolb says, reminding would-be sleuths that the best reliable information often comes from official statements.